We weren’t in Rio long, but with the help of local guides we managed to pack a LOT into our trip. One of the things Mo and I both love to do when travelling, is find ourselves a good view. Rio is full of them. Luckily for us, as we travelled around by car, we managed to catch a fair few. Lovers of architecture, Mo had made sure we visited Niteroi at some point in our trip. Our guide, Ederson, took us to the famous Contemporary Art Museum, but he also surprised us by driving us up to a viewpoint tucked away and free from crowds. 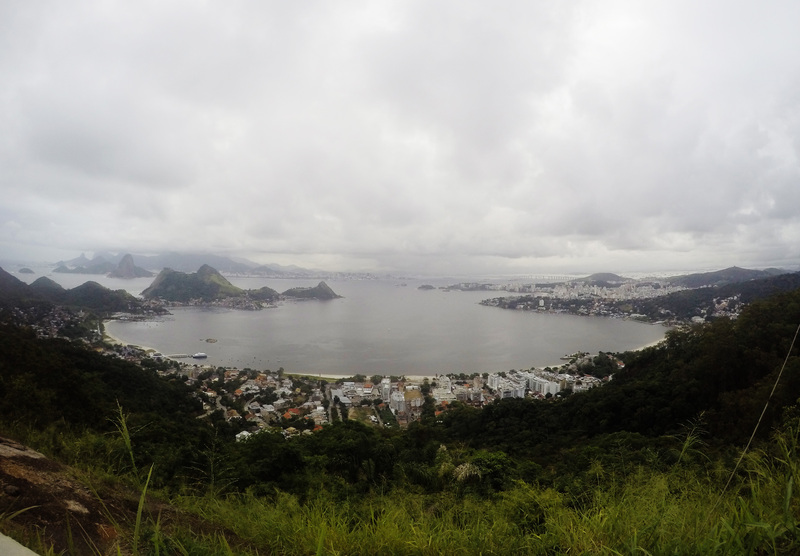 We had only arrived in Rio that morning and looking out, even with the cloudy skies, we were blown away by its beauty. One of the most famous viewpoints not just in Rio, but possibly in the world. If you want to experience it at its finest you need to either hire a car, moped, cycle or get a lift to the top in time for when it opens at 8am. There is a train service that opens at half 8, but trust me even if you’re on the first train you’ll still be dealing with crowds. After racing into the lift. we were literally the first people to arrive at the Cristo Redentor and to be up there, with no other sound but the birds, watching the clouds start to rise and reveal the city… it was 100% worth the early start. I can’t imagine going at any other time. After a full-day of exploring its was just after 3pm when we got to the cable car entrance to take us up to Sugar Loaf mountain. It was Saturday, and the queue was HUGE. Like REALLY huge. we weren’t impressed , but we wanted to watch the sunset from there, a spectacle a fellow queuer had told us was his favourite thing to do in Rio. He was an expat from Uruguay who had been living here for a couple of years and this was the one thing he wanted to do again before he left. Sadly, the large queue meant by the time we got to Sugar Loaf, we had totally missed the sunset anyway. It meant we got to see the city scape by night though, which was a great treat. The amazing thing about this place is how many cafes they’ve managed to put up on the top, great place to sit back, relax and look out for those cute little monkeys. Not the best of them all, but there was something special about our view from the Santa Marta favela. I think it was the atmosphere more than anything, I even wrote a short story about it. As this trip was a birthday treat from Mo, one afternoon he surprised me with a private yacht trip for the afternoon, knowing how much I love being on the water. The whole experience deserves its own blog post, but what I will say is after days of exploring by car it was as if it all came together once we took to the sea. We glided along the coast, out to Niteroi, past the beaches, discovered new places… and finally settled on a spot to watch the sun set between the mountains, over the city. You cannot afford to miss the sunset! Are there any other great places to see the city in Rio?? What’s your favourite part of discovering a new place?